Stone Property News. Featuring Cessnock, Bellbird, Bellbird Heights and Nulkaba. 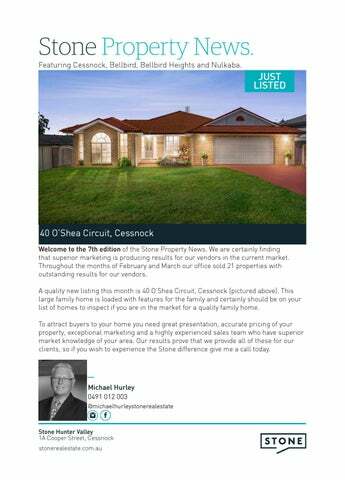 40 Oâ&#x20AC;&#x2122;Shea Circuit, Cessnock Welcome to the 7th edition of the Stone Property News. We are certainly finding that superior marketing is producing results for our vendors in the current market. Throughout the months of February and March our office sold 21 properties with outstanding results for our vendors. A quality new listing this month is 40 Oâ&#x20AC;&#x2122;Shea Circuit, Cessnock (pictured above). This large family home is loaded with features for the family and certainly should be on your list of homes to inspect if you are in the market for a quality family home. To attract buyers to your home you need great presentation, accurate pricing of your property, exceptional marketing and a highly experienced sales team who have superior market knowledge of your area. Our results prove that we provide all of these for our clients, so if you wish to experience the Stone difference give me a call today. Increase The Value Of Your Home First impressions of your home are crucial in getting the buyerâ&#x20AC;&#x2122;s attention. Creating the scene for the photoshoot will bring out the best qualities in your home, to make it as attractive as possible when it is on the market and to help increase interest! Prospective buyers are emotionally affected and this in turn influences their readiness to buy. Remember having a buyer that is emotionally attracted to your home will always get you a premium sale result for your home. Over the next few issues I will provide some tips on maximising the sale price of your home. Tip 1: On most occasions you are selling a lifestyle not just a home so everything you have on display or out when your home is on the market should enhance the image of a great lifestyle for the buyer. â&#x20AC;ş Remove any items that are not necessary or deter from the lifestyle of your targeted buyer market. â&#x20AC;ş Know who your targeted buyer market is when preparing your home for sale, this is an important component in a strong marketing campaign. If you are thinking of selling now or at any time in the future, please feel free to give me a call now as I am more than happy to guide you through this process so you can achieve the best possible result in the market. List with the agent who has the results! I live in the local area, love the local area and sell the local area. List with your area specialist If you want your property SOLD give me a call. Abundant living spaces, indoors and out Wonderfully spacious and located in a sought-after residential estate, this home is a triumph of modern comfort and family-friendly design. Beautifully laid out over a single level, it features grandly proportioned in/outdoor living areas and four bedrooms highlighted by a lifestyle of irresistible ease and convenience within 1km of the nearest vineyard and local golf club. Ideal entry to home ownership Tastefully presented throughout, this welcoming home delivers easy-care living for a new buyer or young family to move in and enjoy immediately with nothing to add. Highlighted by a semi-enclosed alfresco entertaining area, secure swimming pool and triple carport, it’s a wonderful entry-level home that’s a short walk from the centre of town. Family-ready in lifestyle setting This quality-built Cavalier home combines all the elements essential to modern living; a single-level design, well thought out living and bedroom areas and easy indoor/outdoor flow, all putting family functionality top of mind. Add a terrific lifestyle address a stroll from Bellbird Hotel and 5-minutes from Cessnock and local wineries and you have a winning family package.